When I was a little girl, I went through lots of weird phases. I don't remember learning to rhyme per say, but I DO remember being obsessed with "The Name Song". (Substitute any name of your choosing for Andrea, and rhyme accordingly). I remember singing it over and over and over in the car, putting in everyone's name that I could think of. I don't know if that song was how I first learned to rhyme, or if it just provided me with (ample) practice, but my love of rhyming continued throughout my childhood. One of my few memories from elementary school is actually writing a poem of which my second-grade teacher was so proud, she had the principal read it over the PA system. (Pretty sure it wasn't that great - I remember the opening line being "The wind is blowing through the trees / honey is being made by bees"... passive verbs = gross! haha). So yes, I loved rhyming as a kid, and had lots of fun playing with sounds in words and figuring out rhymes. But, sources (aka Google haha) have informed me that kids these days aren't singing annoying rhyme-producing songs with their parents as often, and lots of kids are starting school barely having been read to. 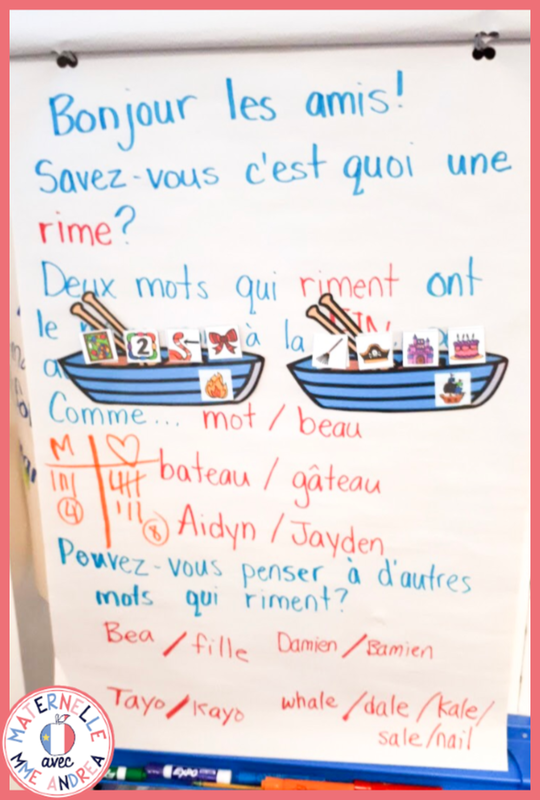 This means that some (or many, depending on your clientele) of your students may start maternelle not knowing what rhymes are, how to identify them, how to anticipate them, and/or how to produce them. But, if you've read my last blog post, you know that rhyming is mega important, and is a skill that our students need to master if we want them to become successful readers. 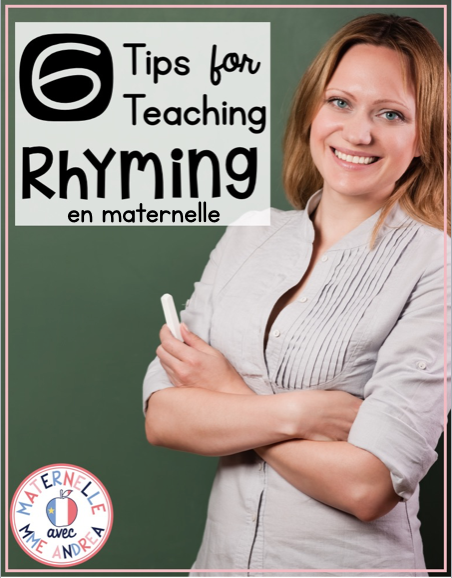 Read on for six tips you can use to help you teach and practice rhymes in your maternelle classroom! Most of teaching rhyming should be hands-on and engaging... not so much sitting still and listening. That being said, a quick little anchor chart is a great way to introduce the concept of rhyming! Just write up a simple definition (words that rhyme have the same sounds at the ends of them, for example), and decorate it with images of rhyming pairs. You can also have your students provide you with examples of rhyming words, which you can add to the chart. Take a few minutes each day to review the definition and examples until everyone understands. Here is an example of one of my anchor chart... it is not Pinterest-worthy or very pretty, but I made it with my kids and it's the only example I have to show you, haha! (The boats are from a rhyming game that we play called Les mots dans un bateau - it's a free game in my French Resource Library, and you can read more about it right HERE). You will only need to spend a few minutes a day on direct instruction when you are teaching your students about rhymes. Your students will learn best via hands-on, engaging, and meaningful activities, where they are active participants figuring out rhyming. You can practice via songs, stories, poems, games, and other fun activities. 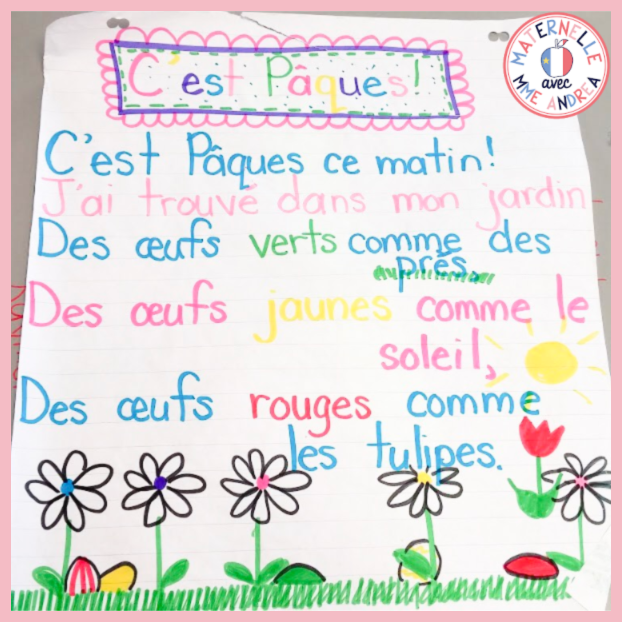 It can be as simple as reading a poem together and circling the words that rhyme, or reading a story and pointing out a rhyming couplet, like this one from La vie secrète des bonhommes de neige. Using students' names to make nonsense rhymes is always silly and a lot of fun! While the Name Song isn't really in French, you could totally change Banana Fana to Ba-na-ne Fa-ne and use it with your students' names. I also like to send them to get dressed, pass out their reading bags, etc. by using rhymes - especially as we are learning the alphabet. I will just stick the sound of the day in front of their names. For example, if the letter of the day is S, I will call out Sayden, Sarlotte, and Sateo instead of Jayden, Charlotte, and Mateo. *Just be careful with that one - most of the time, giggles ensue, but some kids can be sensitive about their names and not like to be called something else. If I have students who look like they might get upset, I make sure to add "si ton nom rime avec Sayden", rather than just call "Sayden". Songs, chants, and poems are meaningful, engaging and fun for our students. They are excited and proud to learn them by heart - and the rhythm and rhymes within the songs and poems help them remember all of the words. They can also practice anticipating rhyming words, and you can even write some of your own. 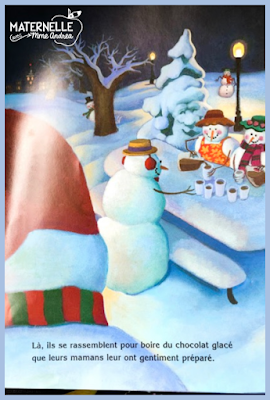 Just like songs and poems, books that rhyme give students the opportunity to hear how rhymes sound in a meaningful way. You can point out rhyming words to your students, and encourage them to listen for them, too. Rhyming books often have a different vocabulary and word choice than a similar story that doesn't rhyme, because the author has to be conscious of rhythm and rhyme as they are writing. This can provide your students with exposure to some new vocabulary words and/or synonyms. You don't need a long or fancy lesson to practice rhyming with your students. You can rhyme anywhere and everywhere, at any time during the day! Make up rhymes when you are waiting in line somewhere, point out rhymes that your students (or you!) say without even realizing, ask students to produce a word that rhymes with a target word before they can go change their shoes, etc. Of course, you can (and should!) also incorporate rhyming into whole group lessons, small group lessons, and independent centres. But, it's super easy to throw in a round or two of the Name Song at any point in the day - and every bit of practice helps!